FourWinds Interactive is available as the campus standard solution for creating and displaying departmental digital signage. ITS Client Services now offers full support for this service and will assist departments with the selection, purchase, installation and support for the hardware configuration and software application in the administrative areas of campus. For digital signage used for classroom or learning space areas, please refer to the Classroom Technology Services website for more information. Read the following information and when you decide to add a digital display to your department or upgrade an existing display, please submit the Digital Signage Request Form. A project leader from ITS Client Services will contact you upon receipt of the form. There are three components to be considered with digital signage: Display, Player, and Content. 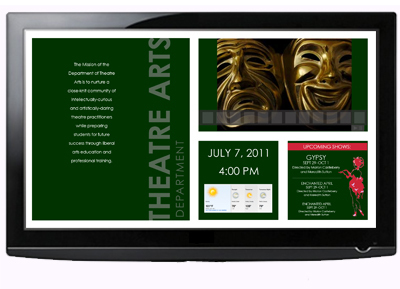 Digital signage displays need to be commercial grade displays that are designed to run 24x7. Campus standard displays should be purchased from Baylor Technology Procurement after consultation with the ITS project leader. 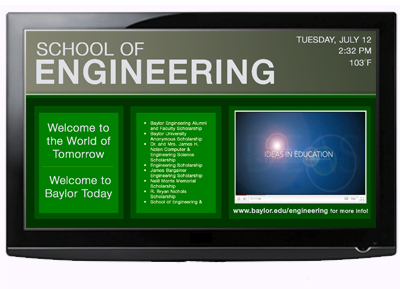 Baylor University ITS Installs has created a standard image for use by computers in the digital signage environments. These players run Windows 10 on a Dell Micro Tower platform. The player computer is a small platform that can be mounted directly behind the display and can be secured to the back of most of the display brackets. They can be ordered through the Baylor Technology Procurement website. 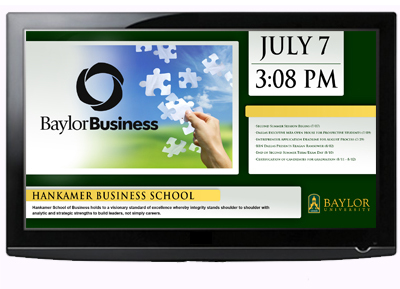 Baylor has entered into a contract with Four Winds Interactive to use their digital signage software. In addition to the application provided by FWI, their software includes the ability to display native PowerPoint files, standard graphics, movie files, web pages and RSS feeds, in addition to custom content created in the application itself. A template will be provided by ITS for setting up and displaying departmental information. Further creative design for the content and refreshing of the signage must be provided by the department. ITS will offer training and support for the administration of the display and the use of the software application and implementation of the standard template. ITS provides periodic training and informational sessions to help departments make the most of their signage. These Guidelines offer basic information for you to start using your digital display. Support for Digital Signage is provided by ITS by contacting the Help Desk or the Digital Signage Admins. There is also a Digital Signage Support Group for questions and discussions between users.